Emma Liza Melchor, a 27-year-old Latina, was pronounced dead on Thursday, April 11, after she was shot in the 1800 block of East Alondra Boulevard in Compton, according to Los Angeles County Medical Examiner-Coroner records. Melchor had been living with her family in Moreno Valley after she was paroled from prison in February, but she left home a short time later after a disagreement with her mother and started staying with friends in Compton, said Los Angeles County Sheriff's Lt. Derrick Alfred. "She didn't like her mom's rules," Alfred said. On April 11, deputies were called to an abandoned commercial building around 8 p.m. after someone reported finding a dead woman inside. 10300 block S. Main St.
Glenn Edward Mitchell, a 55-year-old black man, was shot and killed Thursday, April 11, in the 10300 block of South Main Street in Broadway-Manchester, according to Los Angeles County Medical Examiner-Coroner’s records. About 6:20 p.m., a group of people were standing outside a liquor store when a vehicle drove by and a person inside began firing a gun at the group, said Los Angeles Police Det. Nathan Kouri. 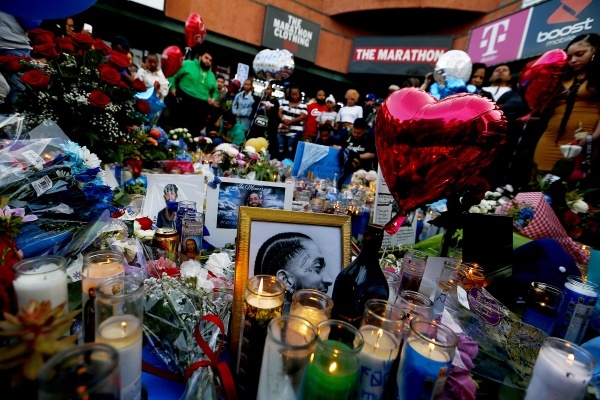 The shooting occurred near the route where people had gathered for the funeral procession for the slain rapper Nipsey Hussle. Five people were wounded and taken to a hospital. Mitchell was pronounced dead at 6:52 p.m., according to coroner’s records. The four who were wounded will survive, police said. Christian Dimitri Grimaldo, a 23-year-old Latino male, died Tuesday, April 9, after being shot in Norwalk, according to Los Angeles County Medical Examiner-Coroner's records. Jorge Alberto Gracida Valencia, a 21-year-old Latino, was shot and killed Monday, April 8, in the 900 block of South Saint Andrews Place in Koreatown, according to Los Angeles County coroner’s records. Shortly before 10:15 p.m., officers from the Los Angeles Police Department’s Olympic Division responded to a call of a shooting and found Gracida Valencia with gunshot wounds, according to an LAPD news release. Gracida Valencia was pronounced dead at the scene at 10:23 p.m., according to coroner’s records. Gracida Valencia was with two friends when a person walked up to the three, police said. The person challenged one of the men to a fight, pulled out a gun and an altercation occurred. Gracida Valencia tried to disarm the gunman, but was shot, police said. William Harris, a 33-year-old black man, died Monday, April 8, after he was shot in the 6900 block of Denver Avenue in Vermont-Slauson, according to Los Angeles County Medical Examiner-Coroner’s records. On Sunday, April 7, about 11:45 p.m., Harris was standing or seated in the driver’s seat of a white Lexus when a man approached him wearing dark clothing, said Los Angeles police Det. Dave Garrido. The person began shooting at Harris, then fled south to West 70th Street. Harris was taken to a hospital, where he was pronounced dead on April 8 at 12:13 a.m., according to coroner’s records. Police said Harris did not live in the area. 6400 block S. Victoria Ave.
Gary Dwayne Patton, a 27-year-old black man, was shot and killed Saturday, April 6, in the 6400 block of South Victoria Avenue in Hyde Park, according to Los Angeles County coroner’s records. About 8:45 p.m., Patton got into a dispute with his neighbor, said Los Angeles Police Det. Dave Garrido. The man pulled out a gun and shot Patton, who has a relative living at the apartment complex. The gunman fled on a motorized scooter, Garrido said. Patton was taken to a hospital, where he was pronounced dead at 9:55 p.m., according to coroner’s records. The suspect, Antonio Johnson, a 41-year-old black man, was arrested on suspicion of murder three days later. 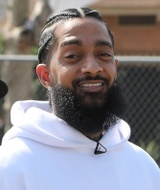 Ermias Asghedom, also known as the rap artist Nipsey Hussle, a 33-year-old black man, was shot and killed Sunday, March 31, in the 3400 block of West Slauson Avenue in Hyde Park, according to Los Angeles County medical examiner-coroner’s records. About 3:20 p.m. Hussle, along with two others, were standing outside the rapper’s store, Marathon Clothing, when a man walked up and fired “numerous” shots at the three men. Hussle was taken to a hospital, where he was pronounced dead at 3:55 p.m., according to coroner’s records. The two others were wounded but survived. The gunman ran through an alley to a waiting white Chevy Cruze, driven by a woman, who later told police she was unaware of the shooting. 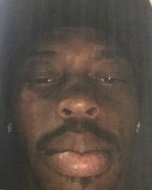 A day after the incident, police identified the suspect as 29-year-old Eric Ronald Holder Jr. and released his photograph. Shaun Michael Stevenson, a 40-year-old black man, was shot and killed Thursday, March 28 in the 900 block of East 114th Street in Green Meadows, according to Los Angeles County Medical Examiner-Coroner's records. About 9:45 a.m., Stevenson was sitting in a white Lincoln Mark in front of a home when a white SUV drove by and stopped, said Los Angeles Police Det. Nathan Kouri. A person inside the SUV began shooting at Stevenson, Kouri said. Stevenson was pronounced dead at the scene at 9:55 a.m., according to coroner's records. Anyone with information on the case is asked to call (323) 786-5111. Those who wish to remain anonymous can call Crime Stoppers at (800) 222-8477. CORRECTION: A previous version of this post identified the victim as Michael Shawn Stevenson. Family members have told the Times that the correct identification is Shaun Michael Stevenson. Justin Antonio Montes, a 25-year-old Latino, was shot and killed Thursday, March 28, in the 400 block of West Santa Cruz Street in San Pedro, according to Los Angeles County coroner’s records. Shortly before 10 p.m., Montes and his 24-year-old brother, Jason, were walking in the area when a sedan approached and a person got out, said Los Angeles Police Officer Jeffrey Tiffin. The person fired multiple rounds, striking the brothers, then the sedan fled. Justin Montes was taken to a hospital, where he was pronounced dead at 10:27 p.m. His brother, Jason Montes, was pronounced dead at the scene at 10 p.m. The brothers, who lived in the area, were walking toward a liquor store. Neither of them was a gang member, Tiffin said. Both were fathers of young children. Tocana Fatima Toca, a 38-year-old black woman, was shot and killed Wednesday, March 27, in the 4100 block of South 3rd Avenue in Leimert Park, according to Los Angeles County Medical Examiner-Coroner's records. Shortly before 4 p.m. police responded to a call of shots fired, said Los Angeles Police Det. Robert Lait. Toca was discovered in a nearby alley, about a half-block south of Martin Luther King Jr. Boulevard with gunshot wounds, police said. Investigators think the gunman walked up to Toca and shot her. Toca was pronounced dead at the scene at 4:10 p.m.
Investigators believe that Toca was in the area to meet someone, but it's unclear why. Anyone with information is asked to call (323) 786-5111. Those who wish to remain anonymous can call Crime Stoppers at (800) 222-8477. 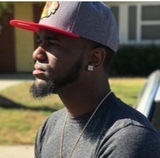 Brian Leslie Statler, a 30-year-old black man, was shot and killed by Inglewood police Wednesday, March 27, in the 300 block of S. Market Street in Inglewood, according to Los Angeles County Medical Examiner-Coroner’s records. About 3:30 p.m., Statler drove up to the Church of Scientology of Inglewood in a white Bentley and walked inside with a “very large sword,” police said. About five people were in the lobby when Statler entered. Police would not describe what happened inside, but said that two police officers, along with Statler, were shot. Statler was taken to a hospital, where he was pronounced dead at 4:33 p.m., according to coroner’s records. One officer was shot in the hand, the other in the forearm. Neither injury was believed to be life-threatening. Monica Marie Abarca, a 29-year-old Latino female, died Tuesday, March 26, after being shot in Compton, according to Los Angeles County Medical Examiner-Coroner's records.